Medical historian and popular blogger Fitzharris narrates the quest of a tenacious 19th-century doctor to save his patients; in the process, he transformed the world of surgery and medicine. Joseph Lister’s choice to become a surgeon was not the most obvious or reputable one for a Quaker growing up as the son of an esteemed scientist acclaimed for his improvements to the microscope. In the early 1800s, a surgeon was little more than a butcher, a “manual laborer who used his hands to make a living, much like a key cutter or plumber today.” It didn’t help that surgery was extremely risky for patients. The introduction of ether to British medicine in 1846 was a critical turning point because it afforded surgeons more time to perform procedures. However, patients were still dying of post-surgical infections in high numbers, and Louis Pasteur’s ideas about germs were still academic and not widely disseminated. Lister took up Pasteur’s work and applied it to surgery, experimenting and finally finding an antiseptic and technique that successfully lowered rates of postoperative infection. He made it his mission to share his findings with a medical establishment clinging to old beliefs. It is thanks to Lister’s tenacity and belief in the efficacy of his techniques, despite widespread skepticism, that so many people today don’t have to look at surgery as a possible death sentence. 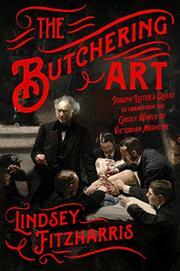 Fitzharris knows how to engage readers in fascinating and shocking details about medical history. She clearly, if sometimes quickly, explains medical and scientific terms and techniques while also using novelistic details and narrative techniques to move the story along. In deftly capturing an “epochal moment when medicine and science merged,” the author also offers an important reminder that, while many regard science as the key to progress, it can only help in so far as people are willing to open their minds to embrace change.